Be part of Italy through its culture, traditions, food, wine, people and backroads. We’ll explore the most famous cities in the world, discover the secrets of Italian life and people of the small towns, enjoy wine tastings in different regions, visit museums and travel down old roads rich in history inland and along the coast, have dinner with locals – all while exploring Italy and improving your photography skills. This tour is an authentic treat. You will experience the essence Italy with a local tour guide that thephotowalkers.com have established a wonderful relationship with. This tour is TRUE ITALY – at its best. REAL ITALY – not the typical tourist tour. Enjoy the itinerary below and Come Join Us! Leanne travelled to WTM (World Travel Market) in London in 2015 – with the aim to meet and partner with travel specialist in interesting and beautiful places. It was here she met Stefano from Italy and together they have been compiling the Ultimate Italian Photo-Tour. In 2017 they had their first tour together and it was an incredible experience. Leanne and Stefano have the same vision which is not only to give the clients an experience that introduces them Italy’s history in the main cities – but to give them an authentic, local ‘back road’ tour that will leave you feeling like you have been a part of Italy. “Those who want to learn about a new special Italian territory, those who want to be fascinated by beautiful monuments and want to get in touch with the daily life and traditions of a real Italian town. Our regions are in the heart of the beautiful country, and in each of them offers you a unique atmosphere, outside the traditional schemes of the most famous Italian destinations. With a territory that goes from the sea to the mountains with art, history, culture, food and wine and people…” Stefano. Italy..
Our photographers years of experience behind the lens and our guides many years of living in and scouting Italy is what puts thephotowalkers.com tours into a league of its own. Architecture in Florence, Rome, the Italian Riviera and the beautiful old buildings of Lucca. The meeting point is in Florence and the ending point in Rome. This allows us more time in each of the special gems that we have carefully chosen for this tour. There is an express train from that runs between the two cities and takes 1.5 hours. Meet at 14h00 at a central meeting point in Florence for a welcome from Stefano and photography brief by Leanne and Peter who will also check your camera settings to help make sure that you are set up and ready to capture Italy as best you can. At 16h00 explore De Dome, Ponte Vecchio and onto welcome dinner at the Italian Restaurant that the locals love. This is an authentic and wonderful experience and all the food and wine is included. Breakfast on own and meet at 09h30 with bags packed for Lucca. En Route – we will have a wine tasting experience in Tuscany at Val d’Orcia followed by an incredible Italian feast and day of hospitality on one of Tuscany’s oldest wine farms, followed by a bus trip to Lucca with an orientation walk by Stefano and dinner on own. An early morning photoshoot in the streets of Lucca followed by breakfast – a shopping break, lunch on own and meet in the afternoon for a traditional Italian Cooking Class. Here you will make your own dinner and the group will share an Italian picnic together on a rooftop overlooking Lucca. Breakfast at leisure and meet at 09h00 to discover Lucca’s hidden gems – through Artisans, Food, Lace, Antiques, People and Food. Drive to Cinque Terre at 15h00 and check in. Orientation walk by Stefano combined with photography and Dinner with group on the waterside and some low-light photography. An early morning photo shoot of the reflections and boats and then a day of discovery, leisure, boat trips and incredible walks along paths, mountainsides, beaches and through the small streets. The fitter folk can hike from Monterosso to Vernazza along the footpaths during part of this day if you wish. Dinner on own. Breakfast and check out. Depart for Bologna at 10h00. Check in. 14h30 Meet Lino for special guided tour of Bologna. This is a photography treat – as Lino ha s been a professional photographer in Bologna for many years and shows us the gems of the city as well as the best angles to capture them at. Dinner and any additional information on the city with the group. Free day shopping, exploring, downloading pics, resting in beautiful Bologna. Dinner on own. Breakfast at Hotel – depart 09h00 for Ascoli Piceno – stopping along the way to photograph some small towns and beautiful landscapes. Check in and meat Stefano at 14h30 for orientation walk through this little gem. Dinner on Own. Breakfast and meet at 10h00 for a History tour of Ascoli Piceno followed by lunch with tickets at fried festival. This afternoon, evening and night are wonderful We are in a beautiful small Italian town and will photograph the streets, people and nightlife. This day is a treat. Depart at 09h00 after breakfast stop and stop and photograph the 7 wonderful waterfalls and bridges that surround Ascoli Piceno. Head to celebrate Workers Day on Cocci Grifoni wine farm that is run by three generations of woman. Today we are the only guests and enjoy lunch with everyone who works on the farm. The farm is closed to the public for the day. A wonderful experience of Italian people celebrating the fruits of their labour on their land. A private tour of the farm and cellars after lunch with unique photo opportunities. Back to Ascoli Piceno and dinner on own. 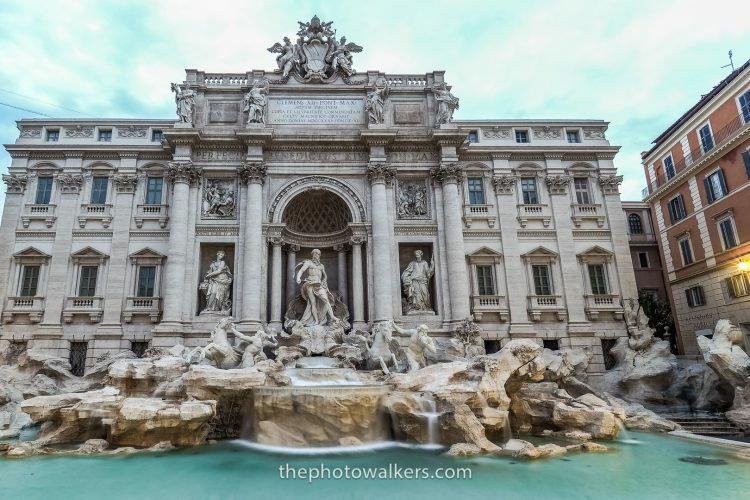 Early morning Shutter Speed Workshop at the Trevi Fountain. Back to hotel for Breakfast and check out. Leave bags at hotel. Pick up at 11h00 for guided History and Photography tour in Rome. This is great few hours that takes you to the Roman ‘hotspots’ to learn about them and how to capture them well. Lunch en-route and back to Hotel. Depart at 16h00 to FCO Airport or train station to go back to Florence for departure. Please make sure your international flights depart from 21h00. If you require an additional night in Rome at the same hotel, we can arrange that for you. We can also arrange any transport if you wish to stay in Italy and travel to another Italian town or city. You are welcome to arrive a day earlier or stay a day later and we will book your room for you at the same hotel that you choose at no additional booking cost. You will only pay for the room and taxes – and additional airport transfers. All transport based on the itinerary is included. Day of arrival – 22 April: Collection from Florence Airport or the Florence Train Station are included. Please arrive by 10h00 the latest. Day of arrival – 3 May: Transfer to Rome Airport (FCO) or the Rome Train Station are included. Please book your flight tickets from about 21h00 – and the train from about 19h00. If you require an airport or train transfer other than on the morning of 22 April or the evening of 3 May there will be an additional charge. This is an incredible tour and we are trying to keep the costs as low as possible. In order for us to offer the best price for this tour – we need 14 people – so spread the word! The prices quoted below are in rooms sharing either in double or twin beds. (If you come on your own, we will match you with someone similar to you from the group and introduce you before the tour starts). If we have 10 or 11 people booked – the price is an additional €500.00 per person and if we have 12 or 13 people booked there is an additional €250.00 per person – so bring your friends and family and lets get to 14 people! A deposit of €500.00 per person is required to secure your place/s. This will be held in a trust account and refunded to you should the correct number of people (fourteen) not be reached by the closing date for the tour – 31 January 2019. However, when we have bookings of 10 people we will confirm the trip with you and your deposit will count as a part payment. If at this date we have less than 14 – we will contact you and let you know the price per person based on the numbers confirmed. You will then have the option to hold or cancel your booking. 50% of the balance is payable by no later than 10 February 2019 and the balance is payable in full by 31 March 2019. An Italian Tour Guide to take you through the ‘real’ side of Italy. All Accommodation including 2 nights in Lucca, 2 nights in Ascoli Piceno, 2 nights on the Italian Riviera in Le Cinque Terre Area, 2 nights in Bologna, 1 night in Florence, 1 night in Rome. Workers day celebration on a wine farm with all of the local workers – hosted by the 3 generations that have owned the farm for more than 500 years. We are invited as the only outsiders and this is a unique and wonderful experience. The greatest feast that you will experience on one of the oldest wine farms in the Tuscan Hills of Italy. Here you will experience a tour of the farm and cellars and when the ‘Italians Mama’s’ call – you head to their dining room where there are wine tastings paired with all food produced on their farm. This is a slow afternoon of laughter and cheer – the feast takes about 4 hours and it’s followed by a sleepy bus trip back to your hotel. Comfortable clothing and walking shoes are recommended. The evenings and mornings can get chilly – and there may be light showers. There are beautiful shops in Italy and you will have time to shop if you would like to. In Bologna there are all the leading international brands in one mall!